We’d love your help. 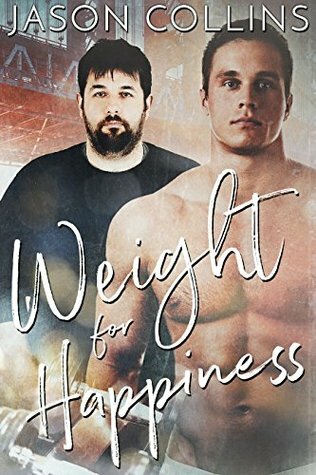 Let us know what’s wrong with this preview of Weight for Happiness by Jason Collins. Jeremy Johnson is stuck between a rock and a hard place. He doesn’t want to be overweight anymore, but temptation is unavoidable thanks to his job. Deciding to make a change for the better, he dedicates himself to implementing a new diet and exercise program that he hopes will whip him into shape. He makes himself a promise that he intends to keep, but it doesn’t help that Jeremy Johnson is stuck between a rock and a hard place. He doesn’t want to be overweight anymore, but temptation is unavoidable thanks to his job. Deciding to make a change for the better, he dedicates himself to implementing a new diet and exercise program that he hopes will whip him into shape. He makes himself a promise that he intends to keep, but it doesn’t help that he works for a food-focused blog where he spends his days writing about delicious, forbidden food that he knows he’s not supposed to indulge in. To ask other readers questions about Weight for Happiness, please sign up. I'll start by saying that this book had great promise of a story about finding love despite the lack of a six-pack, but unfortunately I found the execution to be sorely lacking in... well, almost everything. I cannot say anything about typos and spelling as I spotted no mistakes in that aspect BUT I must say that the overall story needs some more work. Maybe it's just me, but I felt that the hero Jeremy and his "insecurities" were just infuriating. Also, what was with his obsession with Ryan? The I'll start by saying that this book had great promise of a story about finding love despite the lack of a six-pack, but unfortunately I found the execution to be sorely lacking in... well, almost everything. I cannot say anything about typos and spelling as I spotted no mistakes in that aspect BUT I must say that the overall story needs some more work. Maybe it's just me, but I felt that the hero Jeremy and his "insecurities" were just infuriating. Also, what was with his obsession with Ryan? The following contains some spoilers, but I have to get this off my chest, so you've been warned. Jeremy literally meets Ryan on a Friday, they have a lovely Saturday together with some behind the scenes lust, have a fight of sorts on a Sunday and when Ryan has to go out of town on business Jeremy decides to follow him there because he is very insecure about their "relationship". No-one said anything about a relationship, they just spent a night together! Then we discover that Ryan is going to move and all of a sudden it's 3 months later, Jeremy's lost 40 pounds (that's ca 18 kg) and he's still obsessed with what would Ryan think of him. For the life of me, I cannot understand WHY because they knew each other for less than a week. Some drama ensues and the guys finally meet again and they get a HFN... UGH!!!! I think I would like the plot a bit more if Collins had at least made Ryan and Jeremy talk to each other or exchange e-mails or something for those three months Collins simply skips. Of course, it would help if Jeremy's inner voice wouldn't be all about "what does Ryan think about me and my weight?". I do not recommend this book the way it currently is. If and when the author decides to make some changes, then maybe I'd dare to recommend it as the premise is actually pretty decent. So long read The Weight of it All by N.R. Walker instead. That book is awesome. I just couldn't get into this one. I didn't hate it, that wouldn't be fair to say.. I know this author put a lot of time and energy into making a story, as a writer myself, I know how hard it is... I think maybe it just wasn't the right story for me. I thought the dialogue was.....I didn't like it. I thought Jeremy was too obsessed with his weight and insecurities, then he was obsessed with Ryan, and for what? They'd literally spent one or two days together, then got in a fight over something so I just couldn't get into this one. I didn't hate it, that wouldn't be fair to say.. I thought Jeremy was too obsessed with his weight and insecurities, then he was obsessed with Ryan, and for what? They'd literally spent one or two days together, then got in a fight over something so ridiculous that made JEremy seem jealous and clingy.... no, he was jealous and clingy, like....stage 5 clinger. He up and went to spy on him, out of town because he didn't trust him for one night, but they weren't even together, so what would he have done if he saw something he didn't like? I just couldn't get into it at all. I really wanted to because I like the underdogs, the "normal" type. Not having 8 packs and being gods gift to mankind, just your average joe, maybe a bit thick or overweight, the beard on the cover, I mean come on... he's adorable. And with a guy that likes him overweight or not? But, did he really not care if Jeremy was overweight? Cuz, he said he didn't but then kind of acted like he wanted him lose weight and goodness knows that's all the ENTIRE book was about. "Move on," I thought. "Your willpower is not strong enough yet." Losing weight is hard, I would know after suffering for years with a back injury that led to a sedentary life. I used to be fit...active...track, softball, even power walks. Now, I have been reduced to yoga...something I can't even get cheery about. And let's not mention the comfort foods. So, I understand the plight Jeremy faced to present himself as a health conscious person working for a company that promoted fitness. Facing a new life was not going to be easy, not after packing on the pounds while working from home. But Jeremy had an incentive. He was going to be working alongside Ryan; a man who gave him palpitation, a man who could encourage him to keep up with his goals. Yet, even with his man crush so close, Jeremy is faced with a horrible boss who could destroy everything that he is working so hard for. "I no longer needed anyone to validate me." Ryan and Jeremy just were. Both felt the attraction and it wasn't hard not to follow through. But Ryan and Jeremy both unconsciously wanted something they felt the other could not give. One wrong word leads to a decision they both regret, but can they be man enough to save this thing between them, or will both suffer the weight of it all? The romantic aspect was handled through instalove, one of my favorite topics. I wanted more, more more!!! This fast paced story handled a lot, while still holding back. I would have liked to know more about the characters past and how it affected their present. I totally got behind the way the bullying was handled, yay!! This book presented a realism that Jeremy and Ryan faced in order to be with one another; but it took guts and a bit a spying (eye wink) for everything to settle. Author Jason Collins poured his heart and soul into this one. I sense his growth in this writing genre and his confidence. Even though the heat level is to a minimum, he is getting more and more comfortable with suggestions. I look forward to further reads and anticipate even more je ne sais quoi, but I am waiting for it. Very 'new-to-me' author. Willing to give this a try and am thanking KU for the fact that I can "safely" do so. I've been burned by a few books [read: 'new-to-me' authors] in the past and without KU, in this instance, I most likely would not have taken the leap. So thank you, KU :-)!! Cute, fast read. Loved the characters, including the secondary ones. My first read of Jasons, and will def continue to read more of his work. I liked the book but I loved the weight of it all from N. R. Walker more. I know it's not fair from my side because Jason's book is also good. I think it's great that there are books where men struggling with the lose of weight. often it's only spoken about with woman but men have also problems. In this book is missed something..and I'm not sure what..maybe I thought too often on N. R. Walkers book, again not so fair. I love this book. As someone that has struggled with weight and body image all their lives. I could completely understand. I adore that love and work were not the reason for the weight lost but happiness and self worth were. The romantic and acceptance that came along when they did was terrific. This is the 3rd book I’ve read by this author. I did enjoy the characterization of Jeremy and I found him EXTREMELY relatable, however I do feel like the story lacked something. All in all it was an okay read, and I will continue to read books by this author because he can write some really cute and steamy romances. This was just a little more angst then anything. Meh! This story got better at about 38% in, that was chapter 9! Weirdly unrealistic, but there is potential. I will check out more from this author, especially if he has more books in KU. A nice reminder that there really is someone for everyone! The book was good. There was a lack of detail in some places that bothered me but otherwise, it was an interesting story. In my opinion, Jason Collins has done a fantastic job with Weight for Happiness. I loved the ease with which the story flowed and once I started the book, I did not want to stop reading. I particularly liked how Collins chooses to break certain expectations of the romance genre. There are so many novels that feature physically perfect protagonists that for someone like me, who has always struggled with my weight and confidence, Jeremy’s character is validating and r A Joyfully Jay review. In my opinion, Jason Collins has done a fantastic job with Weight for Happiness. I loved the ease with which the story flowed and once I started the book, I did not want to stop reading. I particularly liked how Collins chooses to break certain expectations of the romance genre. There are so many novels that feature physically perfect protagonists that for someone like me, who has always struggled with my weight and confidence, Jeremy’s character is validating and relatable. Many of Jeremy’s issues arise from how he compares himself to others so that he has difficulty in believing Ryan’s compliments, even those about his writing talent. Collins has clearly given careful thought to Jeremy’s character, revealing all of his vulnerabilities and introverted personality, without making him detached. Because of this, I think Jeremy is more substantial and this adds to the authentic richness of Collins’ story. Ryan is opposite to Jeremy in many ways. He is confident, but not arrogant, and just casually accepts the attention he receives from both men and women. He is also kind and much of the time he is in Jeremy’s company is spent reassuring Jeremy and encouraging him, without any hint of reproach. It is Ryan’s acceptance and compassion that made me believe in the relationship between them, although I have to admit that Collins had me guessing about their future together as Weight of Happiness developed. Read Kirsty’s review in its entirety here. The best part about the book is that it is a pretty quick read... okay that might be an exaggeration but I almost stopped reading at 80% but figured I mind as well finish since I was so close to the end. I'm not sure if it was worth it. I didn't like any of the characters. Jeremy is struggling with low self-esteem. Which is fine. That wasn't my problem, although it was a bit annoying at times, but even he recognized he needed to improve his self-esteem, so that was fine. What wasn't fine is that The best part about the book is that it is a pretty quick read... okay that might be an exaggeration but I almost stopped reading at 80% but figured I mind as well finish since I was so close to the end. I'm not sure if it was worth it. I didn't like any of the characters. Jeremy is struggling with low self-esteem. Which is fine. That wasn't my problem, although it was a bit annoying at times, but even he recognized he needed to improve his self-esteem, so that was fine. What wasn't fine is that he is too stupid to live and only survives and avoids catastrophe because he is the protagonist and it isn't that kind of book. I liked the determination Jeremy had to lose weight for himself. His self doubt was funny at times especially when he forgot to keep it inside. Great concept but seriously flawed delivery. They meet on a Friday and not even a week later one of the characters moves across the country yet they are madly in love? In that time frame they work out once, spend a day together, hook up, have a blow out fight, don't talk for a almost 2 days, haver an awkward day or two at work, one goes out of town for business, can't forget the night of stalking (yikes) and the next day one character says he's moving to Florida.... They don't talk for months. Then a surprise visit and that day the guys decides to move back to NY? The concept is great but the time frame is so unbelievable I kept looking back to see if I hard missed a time jump but nope they knew each other less than a week and within what seemed like minutes were ready to move for one another..
Jeremy is down on his luck, and we all know how easy it is to put on weight comfort eating, especially whilst working from home. He wants to lose weight and live healthier but his will power only lasts till he spots a pot of ice cream in the fridge. I know that feeling well. All changes when his Blog is taken over by a healthy eating company. But its not his new work that gives him the power to get fit, it is a new colleague Ryan. Ryan is the definition of fit, and Jeremy can not believe the Ryan Jeremy is down on his luck, and we all know how easy it is to put on weight comfort eating, especially whilst working from home. He wants to lose weight and live healthier but his will power only lasts till he spots a pot of ice cream in the fridge. I know that feeling well. What I really liked about the story is the message that just because you may have a little extra weight, you can still be attractive to others even the fit men out there. Ryan encourages Jeremy to get fit, but not because he has a problem with Jeremy 's weight. But because he wants Jeremy to feel good about himself. I have read a few books of this Author and this one is in my top three so far. Not sure if it's Kindle or the way the book was written, but there are several pages in the beginning that look like they where copy and pasted without making sure the linked up to the previous page. That on top of the stilted writing and scant character development made it difficult to finish this book. Very WELLL Written... Jason has created a very complex character in Jeremy. Jeremy struggles with his weight currently and when he was a child. He goes through all of the self worth and insecurities because he is 40 pounds overweight. The struggles he has in the dating world and wondering why a fit buff gorgeous Ryan would even notice him little lone be interested was very heartfelt and emotional. You feel everything that Jeremy is feeling through out the entire book.